Hurricane Harvey has devastated south Texas and Louisiana. Flood waters have destroyed homes, schools, and impacted TARS’ communities. National TARS is working to send funds and supplies to the TARS who were in the path of destruction. We hope you and your TAR Club will be active in the recovery efforts! The Jewish community of Houston, where State TAR Chairman Adam Hoffman lives, was hit especially hard by the flooding. According to the community’s donation page, “Over 250 families have lost their homes, belongings and cars.” The following video was shared by Robert M. Beren Academy. For more information and to donate to the Houston Jewish community, visit https://www.rmbauos.org/. Kingwood High School, where we have a fantastic TAR Club, has been flooded so badly that the students cannot return to the building this year. “30% of all homes in the community have been lost to the flood,” the Club Advisor wrote us. The following video gives a glimpse of the destruction they have faced. To donate directly to Kingwood High School visit the school’s website here. To help support the victims, you can raise money and send funds to local disaster relief efforts! The River Parishes TARS of Louisiana is working with a local church to collect children’s items such as books, toys, stuffed animals and school supplies. You can partner with local organizations to boost the relief efforts. Put your fundraising skills to use and serve a cause that your whole community can get involved in. Set up a donation table at your local grocery store, GOP event or county fair. Then, send the money to the Jewish community of Houston, Kingwood High School, and other great organizations such as World Vision and Samaritan’s Purse! 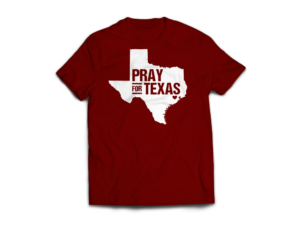 Another way you can support the relief effort is by buying a Pray for Texas t-shirt at PatriotDepot.com. 100% of the profits will go to relief efforts through Samaritan’s Purse! Click here to order yours now! Stay tuned for updates! We want every TAR to get involved! Cover photo courtesy of the River Parishes TARS of Louisiana.